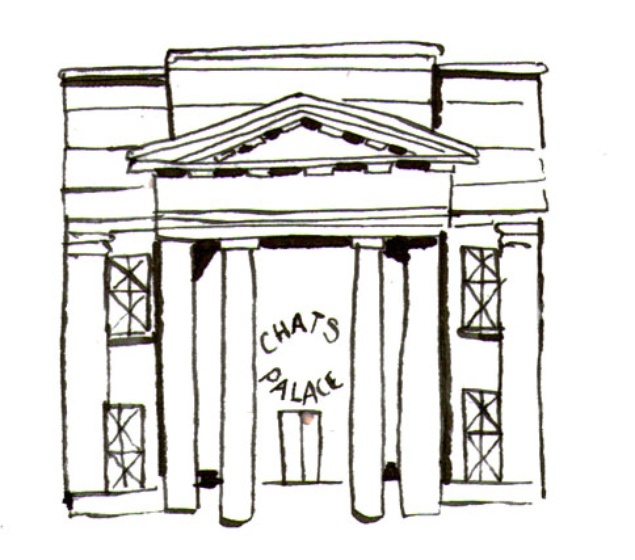 Saffron and Floyd leave Homerton hospital and walk toward a neo-classical building called "Chats Palace". To Saffron's displeasure, Floyd gestures that he is going inside. Saffron waits. Floyd walks into a darkened auditorium. Under a Spotlight a pianist plays and a Caribbean woman of mixed ancestry wearing classic old time music hall dress moves to the music, waiting to begin. This scene will be created as a musical event in February 2019, in collaboration with Randolph Matthews tracing highlights of the musical history of Hackney. Some of the Crowd are at tables, some dancing or standing around. Gradually different “characters” and groups begin to sing or bring out instruments, or to dance.. The Group of Singers and Musicians begins to grow, joining the Singer and Pianist. Because we've got such nobby, distant views. And a pitchfork with the handle of a broom. For we're teaching him to moo just like a cow. Cause my language gets as yokel as can be.